I cannot adequately express my satisfaction and gratitude for Denise Erlich and the Erlich Law Office, LLC. I found myself in a situation where my entire world was imploding around me and I could not have gotten through it without the steady composure, focus and experience that Denise provided me. She is the most caring and understand attorney that I’ve ever had experience with. I found myself dealing with a very manipulative ex and her manipulative attorney, but she always kept me focused and did not let me or the case get distracted by all the “noise” that the other side was creating. Without her steady focus and ability to see through all the distractions that were thrown out there I would have absolutely taken the bait and my divorce process would have had a completely different result. Denise was always available and never made me feel that I was not a priority to her. I felt I could text her or talk to her whenever I had a question or concern no matter how minor it was. She listened closely to my concerns, provided her experienced professional advice and reassured me that everything would be okay. She kept me very well informed every step of the way and if I had any questions, she was timely in returning my calls. If I didn’t agree or didn’t like the way it might turn out in court, she advised me on very good alternatives. She is experienced, tenacious, sharp, ethical and knows family law inside and out. At the same time, she is personable, empathetic and understanding. I could not have made it through the horrible process if it was not for Denise. I am beyond satisfied and thankful I had her on my side. While looking for a lawyer, I googled best divorce lawyers in DuPage County and Denise Erlich’s name appeared. During the free consultation, she explained the whole divorce process in a very understandable way; she listened to all of my questions and answered them with confidence, and honesty, taking as much time as needed with me. I was very impressed by her intelligence and experience. She made me feel extremely comfortable and I knew I wanted her to represent me. She is very hands on and easy to reach, whenever needed, either by phone or email. She gets back to you very quickly and you actually talk to her and not someone that works for her. Denise exceeded all of my expectations. I highly recommend her for any legal representation. Denise helped guide me through a very complicated situation while skillfully advising me through my case at every step. We negotiated the best conclusion possible and I am eternally grateful for her help. I hope you never have to hire an attorney for any reason, but if you do, hire Denise! It is unfortunate that I need to seek personal legal advice, but I am glad that I decided to retain Denise as my lawyer. Very responsive, thorough, and fair billing. Highly recommended. Denise Erlich is one of the hardest working lawyers that I have ever met. I have sent her clients and they all tell me that she is extremely responsive and attentive to their needs – at all hours. Denise truly gets High Conflict Divorce and I know that my clients, who are dealing with difficult ex-spouses, are in good hands with her. I have looked long and hard to find an attorney who can truly understand and work with clients who are already traumatized and stressed out and who knows how not to perpetuate their trauma in the family court system. Denise provides clear and focused legal advice and asserts her clients’ rights so that they can concentrate on their families and their work while going through divorce. For the past three years, I have been involved in a horrific court battle with my son’s mom for custody. I had two lawyers before Denise that just didn’t care about my case. From day one, Denise has been very hardworking and dependable. I have watched her destroy two attorneys at trial. She’s very organized, which means everything in court. There hasn’t been a time I have called nor emailed that she hasn’t responded right away (she has been sick with the flu or on vacation and still answered). Denise is simply the best. It’s a relief to have a great attorney. Denise is a wonderful attorney and human being. She is fair, honest, kind, and tends to her clients’ needs in every way possible. 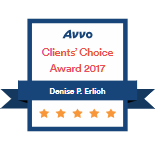 Denise clearly communicates every step involved with the legal processes she carries out and is extremely knowledgeable. She always has her client’s best interests in mind and is very approachable and friendly. Denise represented me for my divorce. This was a very emotional, scary process to go through, but with the help and guidance of Denise, it was much easier. I had multiple questions and concerns. Denise, always answered all my questions whether it was email, in person, or on the phone. She was very prompt, compassionate and knowledgeable. I am very grateful to find a hardworking lawyer and would recommend Denise to anyone. Denise Erlich is a tenacious, thorough, determined, and exceptional lawyer. She is every bit as competent as the downtown lawyers who charge more than double her hourly rate. She is compassionate, but aggressive in obtaining the best settlement. Ms. Erlich helped me get the best settlement possible and supported me emotionally through a difficult and stressful proceeding. Denise stayed ahead of the game by anticipating opposing counsel’s next moves. Ms. Erlich was tenacious and demonstrated confidence and a readiness to go to trial. Her unrelenting work ethic and determination ultimately persuaded the defendant and opposing counsel to settle on terms very favorable for me. Her skill resulted in an outcome that exceeded my expectations. I would HIGHLY recommend Ms. Erlich for your litigation needs. Denise is a brilliant attorney! She is a unique combination of compassion, confidence and competence. Denise represented me in my post divorce case against my ex husband and his corrupt attorney. Denise confidently navigated the court system and put my ex husband and his attorney in their place. Denise is brilliant! Her vast knowledge of the law makes her a leading attorney in her field. Denise is my hero! If you need an honest, rock star attorney, Denise should be your first choice! Denise Erlich is an intelligent, hard-working, compassionate, reasonable and generous lawyer. I really can’t say enough in a review to express my gratitude and respect for her work, but I’ll try. Ms. Erlich helped me get through a highly-contentious divorce trial, and she constantly worked with me on possible solutions instead of allowing me to get caught up in the legal and emotional battles that are involved in these sort of cases. Even though my case was contentious, Ms. Erlich showed the skills to work through collaborative divorce proceedings as well. Up until the trial, she made multiple attempts to forge an agreement, but the opposing attorney was extremely unwilling to negotiate the terms of the agreement. We therefore had to go to trial. When we did, Ms. Erlich was unrelenting in her work in and out of the court to make the best possible case for me. It was a direct result of this hard-working dedication and her skills in the courtroom that I received a decision that exceeded my expectations. No matter what level of legal difficulty you are facing, I would recommend Denise Erlich to help you. Denise provided me with excellent counsel in a collaborative divorce setting. She was excellent in keeping the process moving while allowing me the time to work through the emotions associated with divorce. She was very fair with her fees, and highly ethical. She also kept opposing counsel on task throughout the process. She is an excellent advocate who maintains professionalism and respect for all parties involved. She works efficiently, and tries hard to keep her fees down. I think she genuinely cares about her clients’ well-being. She is a credit to her difficult profession. I’ve been dragged into some really unwanted family law situations over the past five years, and of all the lawyers I’ve worked with in the Chicago area – which are many at this point – Denise Erlich has been far and away the best. She’s compassionate, hard-working and knowledgeable, plus she’s honest and ferocious. I’ve been thrown under the bus by fee-churning opportunists and taken advantage of by impersonal, greedy lawyers before… but Denise bills only for the actual work she does and it’s been a very favorable experience, in spite of the struggle. I highly recommend her! Denise is a generous, compassionate, hard-working lawyer. You can always count on getting a response via email or phone. You are never waiting for days for a reply or feel neglected. I have even gotten replies into the evening when you know she at home and not at the office. I have a high level of respect for her knowledge, understanding, honesty, and her genuine concern for your case. Denise is easy to talk to you and you will be very pleased if you choose her for your legal needs! Denise does an excellent job! Denise Erlich is excellent and I would definitely recommend her. She was thorough and tenacious in preparing my case for litigation but also compassionate in supporting me through this difficult time. She is professional, articulate and very kind. We are very glad we found Denise online. All the reviews helped us decide to use her to take our case. We hired her to replace a lawyer we were using who wasn’t doing a good job and was charging us a lot for not doing much. She is a very fair lawyer. Someone that will speak her mind and tell you the truth. Her advice helped us tremendously. If we would have used anyone else or not listened to her, we would not have had our case turn around. Denise was able to guide us all the way to the final court date. She replied to us within 24 hours and calmed us down during stressful times. Denise is very professional. She let us know exactly what was going on with our case and helped us get the best outcome. Most importantly she can deliver all the work that she did and convince the judge to see the other side of the story. I am very glad that we used her and now it is over. You will have great outcome too. Call her and get a free consultation. I would highly recommend Denise Erlich for any of your legal needs. 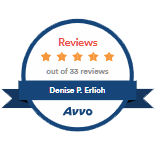 Denise provided me with prompt, professional service throughout my case and at a fair price. Denise excelled at walking me through the legal process of my case, which was important, considering how overwhelming the judicial system can be. I am very glad I had Denise as my lawyer in this process. Very helpful, knowledgeable and caring in what I needed to do. I highly recommend Ms. Erlich’s firm as it offers transparency, speedy representation and reasonable fee structure. Ms. Erlich’s firm stood out after researching through many other law firms in the vicinity. Ms. Erlich’s was very prompt in her communications and protecting the rights of her client in a recent divorce case. Ms. Erlich timely challenged prior/separate filing by the opposing party and saved her client from unjust legal maneuvers. Ms. Erlich is a great listener and willing to go above and beyond to put her client at ease. An awesome law firm experience indeed! I was in an urgent need for a lawyer. I selected Denise as my lawyer because she was close to my work place and had excellent reviews. She was very clear from beginning about her expectations from me, goal setting and promises. She started on my case immediately and contacted the other lawyers. She was very resourceful and consulted with the best lawyers in specific topics such as HIPPA and forensic computer experts. Her writings to the other attorneys were legally powerful and convincing. She definitely made my case turn around to the winning side. Despite being busy, she had very good time efficiency and superiority in mastering the tasks in front of her. She’s honest about her billing and her prices are very reasonable for the job she does. She’s the best attorney I’ve had and I highly recommend her. Denise was a pleasure to work with. She handled our case in a professional manner. It was a tough and detailed procedure dealing with the other attorney. She matched and kept them at bay. She has gone and taken our views of attorneys to a new level. She is kind and understanding, but does not back down if pressured. I would suggest her to anyone who needed a lawyer. She was our hope and helped us through a very hard time. Denise represented me in a real estate litigation suit. She did a great job of managing the other side, positioning our case and getting the matter settled. I would use her again and recommend her to any business looking for a smart, effective lawyer. Don’t waste your money on a “top” law firm which wastes your cash and time, requires a large retainer and it’s gone in less than a month. Hire the best, Denise Erlich! She got our case to settle vs. what could have been a real mess. Denise fought long and hard on our behalf. The judge loved her always being well prepared vs. the shabby not prepared lawyer on other side. She’s very professional and diligent, honest, hard working, and knows forwards and back all the laws and cases possible to help win your case and fight best for your rights. She is trustworthy and not just for show either… like a favorite family relative you love. She looks out for your best interests and lets you know the options good and bad. I owe her so much more than I can even say. Trust her enough to give her your case especially if you have nowhere to go, and if you have a lawyer you can not trust, dump them and hire Denise! Denise was able to help me through a very confusing and difficult time. She was in constant communication, let me know of all of my options and kept me informed every step of the way. I don’t know how I would have done it without her. At a time when I felt most helpless, Denise Erlich was referred to me. She was affordable, fair, and easy to talk to. I always knew where things stood as she was an excellent communicator, responding to phone calls and emails promptly. Also, I did not feel “nickeled and dimed” for every phone call and email. She was knowledgeable and honest on all fronts. I was able to obtain the outcome that I was looking for through her hard work and dedication. I highly recommend Denise! For about two years I had been trying to do everything on my own and I was failing miserably. Then I hired Denise and within a month I was spending time with my son every other weekend, like I was supposed to. She did an amazing job and I appreciate this so much. I wish I had her when I went through my divorce. Denise was very professional, honest, caring, and was very helpful with everything. I highly recommend her if you’re looking for a good lawyer. Attorney Erlich receives my highest recommendation. She handled my case with expediency, legal excellence and genuine concern. She provided the advocacy I needed when I was most vulnerable. Denise listened and explained what were viable legal actions and what were not. With her assistance the case was settled within two weeks. Denise provided clarity (informing me what was realistic and what was not); patience (giving me time to think through the pros and cons of the dilemma); and guidance (trusting me to synthesize the information and make the best decision for myself). If future needs arise, Denise Erlich will be the attorney I hire. Denise is by far, the best attorney I have ever had. There are a number of good things to say about Denise. One of them is that she treats you like family and is concerned about your legal matter. So if you’re looking for a great attorney look no further. I highly recommend her to all. Also I am a very hard person to work with, and Denise handled me in a professional way. She is a great person. If you want a lawyer who gets great results, returns phone calls and e-mails quickly, and can explains things to you so they make sense, I recommend Denise Erlich. I can’t say enough about how impressed I was with the way Denise handled my case and got me a great result without having to go to trial. I strongly recommend Denise if you are looking for a great lawyer to represent you! Denise represented me in a contract dispute. Not only was she incredibly professional but she was also able to remain calm whenever I was emotional. Her demeanor, professionalism, and ability to effectively explain things made me feel so safe and confident in her abilities. She was always one step ahead and displayed impeccable litigation and negotiation skills. I also appreciate that she was always available and eager to answer any questions I had. Denise was willing to fight and go to trial, if necessary, but because of her excellent communication skills and knowledge of the law, she was able to reach a favorable settlement with a very difficult-to-deal-with company. 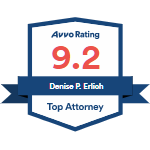 Bottom line — Denise is an outstanding attorney and will look out for your best interests! I would highly recommend her for legal representation. I hired Denise as my attorney when a former business acquaintance claimed that I personally guaranteed a debt and sued me personally. Denise reviewed my case carefully, explained the strengths and weaknesses of my defense, and cautioned me on the pitfalls of going to trial. Denise kept me informed at every step regarding our litigation strategy and promptly returned my phone calls and answered my questions. Denise was very organized and had a thorough understanding of the facts and the law. She was always well-prepared in court and was able to move the case along quickly and avoid unnecessary court appearances. Much to my pleasant surprise, we didn’t have to go to trial because the case was thrown out due to Denise’s well-written pre-trial motions! Denise was sensitive to my desire to keep litigation costs to a minimum and her fees were very reasonable. I highly recommend Denise to anyone who needs a good attorney! Denise is a great attorney and is great at what she does.. She does the research and gives us confidence in what she does. She always tells us what our options are, good or bad. Highly Recommended! If you are looking for not just “any” litigation lawyer but the best available in Chicagoland, here she is! Denise isn’t just the best Litigation Lawyer either! She is an “angel on earth”… the best you could ever dream of having! She has always been very upfront, honest and knowledgeable. Denise has worked tirelessly for us. She successfully pushed the case to a lower court and is now trying to get the lawsuit dismissed. I highly recommend her not just for her professional prowess, but also for her honest personality which shows she has a good heart, cares about all of her clients personally, tries to help as she can, and a very decent person with morals, ethics, and integrity. Her career will be full of future success stories & cases won for honest people who have or are being taken advantage of in lawsuits against them.